We had the perfect location, build a nice wall and wood frame to keep out the deer all other wildlife (so we thought). We filled the beds with a foot of rich garden soil. Our town mulches and composts all leaves and garden waste for residents to pick up. Great service ! 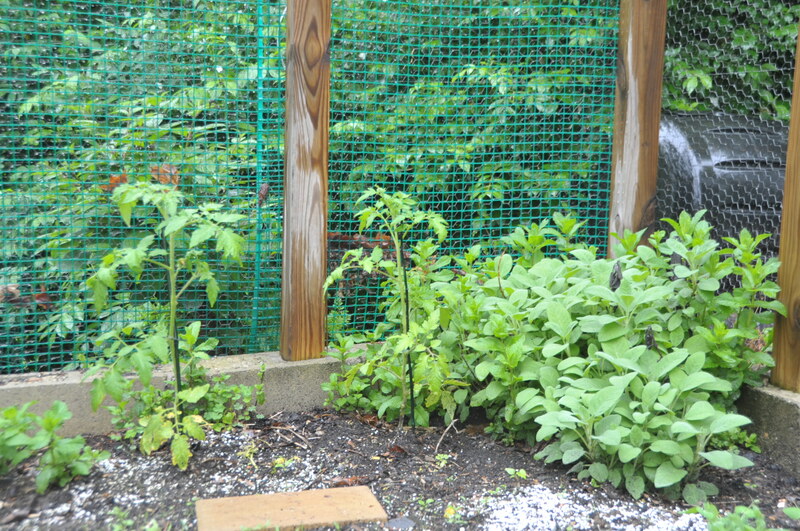 The netting keeps the larger animals out – deer hang out happily around the house when nobody is outside and eat nearly anything that is growing and looks pretty. Some birds still get trapped after they sneak in through the gaps around the door, but hanging CDs scare them away most of the time. That leaves the chipmunks – short of killing them I have found nothing that keeps them away from tasty tomatoes. As a result every nearly every one of the hundreds of tomatoes we had last year was nibbled at. It took a few years to figure out the basics and by now the trees south of the garden have grown so much more that most of the patch is in the shade by 3 at this time of the year. Now the best husband of all will make a new garden patch to the most sunny spot in out garden, just 20 feet north. One of the many projects in the pipeline for this year. I am so jealous! This veggie garden is great! You just moved balcony garden higher up on my to do list!